In a race polls had consistently neck-and-neck, Republican Cory Gardner celebrated a decisive victory for one of Colorado's two U.S. Senate seats Tuesday night over incumbent Democrat Mark Udall. 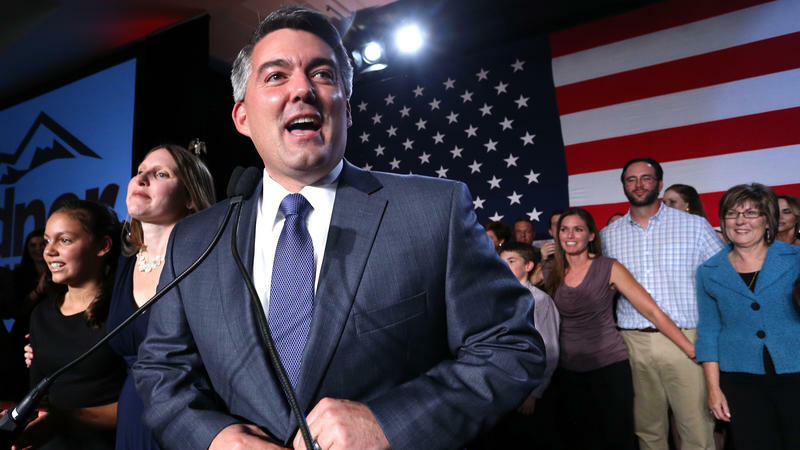 Gardner becomes the first candidate to unseat an incumbent Colorado Senator since 1978. Colorado's U.S. Senate seat has been a tightly fought race characterized by a razor-thin difference between the candidates in the polls. It's also been a race that many nationally have pinned control over the Senate on. Polls in Colorado close at 7 p.m. MST, results will be gathered here. Watching election returns can seem boring. However recent elections in Colorado have become something worth watching. Colorado's U.S. Senate and gubernatorial races are too close to call. Those race results will be the byproduct of an increasingly complex election and demographic landscape developing across the state. What follows is a short list of characters and storylines to consider that go beyond the candidates. So pop your popcorn and settle in for some political night drama. Election Day is less than a week away, and campaigns for close races for U.S. Senate and Governor are making their final pitch to voters. In order to get a sense of what could tip the balance in these tossup races for Governor and Senate, we picked the brains of reporters that work at the state capitol. A new poll finds Colorado's Governor and Senate races remain close. Republican Cory Gardner is still ahead of Democrat Mark Udall in the Senate race, but the gap has closed to 3 points, with 46 percent for Gardner, and 43 percent for Udall. The governor's race remains a statistical dead heat between Democratic Governor John Hickenlooper and Republican Bob Beauprez, with 45 percent in favor of Hickenlooper and 44 percent for Beauprez. Incumbent Democratic Senator Mark Udall swung through the University of Northern Colorado in Greeley to recruit volunteers and get voters fired up for Election Day. The county is well-known as a conservative stronghold expected to support Republican challenger Cory Gardner. "We need you all to get out, get people into the neighborhoods, knocking on the doors, making the case," Udall told the small group, stressing that every vote counts. Whether it’s advertising on television, commercial radio or even YouTube, both sides in Colorado’s U.S. Senate race are ramping up their efforts to get a leg-up in the final weeks before the election. It turns out the candidates are receiving a significant amount of funding from Super PACs outside of the state, underscoring a race that is seen as critical for control of the Senate. Democratic Senator Mark Udall and Republican Congressman Cory Gardner had a spirited debate Tuesday night hosted by The Denver Post. Both candidates are locked in a tight race and both stayed on message in the hour-long debate. Udall attacked Gardner as extreme and out of touch, Gardner criticized Udall for being in lockstep with President Barack Obama.